Save To Calendar 04/25/2019 5:00 pm 04/25/2019 10:00 pm America/Chicago The 81st Band Festival For one night only, more than 4,900 musicians from local high school bands join together for an amazing performance. You don’t want to miss it! Every year, students from more than 30 local high school bands join together to present an entertaining musical evening that is undoubtedly one of Fiesta’s most popular events. Some of the highlights include Herald Trumpets, parades of bands with colorful flags and twirlers, and feature bands performing their award-winning UIL shows for the crowd. At the end of the evening, all musicians will perform together in a spectacular finale set to fireworks! The Battle of Flowers Band Festival was first held in 1937, and is the oldest and longest running marching Band Festival in the country. The purpose of the Band Festival is to offer high school bands a unique opportunity to perform together and encourage their interest in music. Top placing bands and fan favorites are awarded with “Celebration of Music” grants to support and encourage the arts in our local schools. Tickets are available for purchase to the general public. Please email us with any questions, or if you need more information. Click here to learn more about our Band Festival Cover Design Contest! 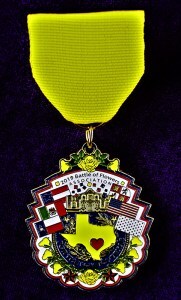 The 2019 Battle of Flowers® Association Parade & Band Festival Medal “For the Love of Texas” can be purchased for $7 plus tax at the Fiesta Commission Store through May 1, 2019. The medal will also be available in limited quantities at the Battle of Flowers® Parade, Band Festival and Fiesta Arts Fair.